The mission of the Kaukauna Police Department is to enhance the quality of life in the City of Kaukauna by working with the public to enforce the law and provide for a safe environment. The Kaukauna Police Department will strive to provide quality police services and promote a “partnership for a safer community” through police and citizen interaction, with emphasis on education, respect, fairness and integrity. Hello, my name is John Manion, and I am proud and have the honor to say that I am the Chief of Police for the Kaukauna Police Department. 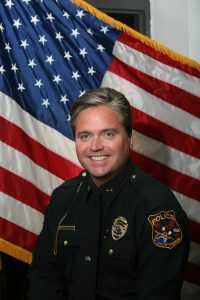 I have been the Chief of Police for over ten years, and because of the people I work with, we have made this a great department that serves the community. We believe that everyone should be treated with dignity and respect, the way we would like to be treated, especially in a time of need. It is not our job to judge character, but that of one’s behavior. We enforce the laws and ordinances set forth by governing bodies with ethical and honest decision making efforts. When I think to myself, is this a safe city? I check this by watching the people as they move about. Are the elderly people walking at dusk and families riding their bikes together? We watch to see if there are little problems developing in neighborhoods, and try to address them right away before they become bigger problems. Are people generally smiling in their daily lives, do I hear negative comments as I work and live in the community? These are the things we pay attention to. As we move forward listening to concerns, we are always open to constructive criticism and trying new ways to serve the public. Please enjoy our community, add to its safety and comfort levels by doing what’s right. Be an asset, not a liability and thrive to live your life in a great community like the City of Kaukauna. The Police Department is open 24/7 for officers to assist you.